When It Comes to Menstrual Pain Relief, Acupuncture Wins - Doctor Hermann M.D.,P.A. If there’s one thing all women can relate to, it’s the miseries of menstrual pain. While it’s most common to take an over-the-counter medication like ibuprofen to alleviate cramping, new research has proven that acupuncture is actually a more effective form of pain relief. 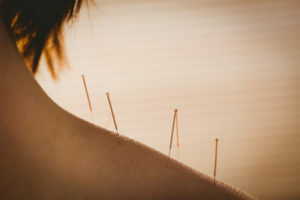 Acupuncture is an ancient Chinese practice that uses tiny needles to puncture precise points of the body. According to traditional Chinese medicine, the body contains channels of energy, called meridians, that run in regular patterns like rivers to nourish the tissues of the body. When something obstructs the movement of the meridians, health problems ensue. The puncture points in acupuncture are said to unblock the obstructions and help reestablish normal energy flow. In modern science, acupuncture is believed to stimulate the nervous system to release important chemicals and hormones in the spinal cord, brain, and muscles to relieve pain and help the body regulate its own healing. By bringing the body’s biochemical activities into balance, acupuncture promotes physical and emotional wellness. In three independent studies, researchers discovered that acupuncture is actually more effective than ibuprofen. While ibuprofen only temporarily relieves the inflammation that causes cramping, acupuncture actually improves blood circulation and other blood flow characteristics. The study completed by Hubei University of Medicine researchers concluded that acupuncture with moxibustion has a 96.8% total treatment effective rate compared to ibuprofen’s much lower 58.1%. Such dramatic findings might be challenged, but they are consistent with other independent research. This makes sense, since any help regulating blood flow through the abdominal cavity can help calm muscular contractions. Acupuncture is also known to increase endorphin release, which will also minimize pain and even offer the added bonus of reducing the irritability that is common with PMS. The next time “that time of the month” has you feeling miserable, consider a more holistic way to relieve your body, and you can end your reliance on inefficient medications.